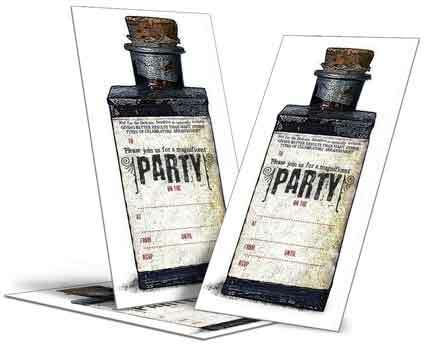 Just what you need if you are arranging a wizarding party, an invitation card shaped like an old fashioned potions bottle. These invites can be printed out on paper, or for a really stylish invite, they can be printed out on a light weight (or thicker) card. You can just cut the paper into thirds, or you can cut round the bottle so that the invitation is actually bottle shaped. Whatever you do, the invite will fit in a normal letter envelope. For a party, the excitement begins with planning it and funky invitations are a really good way to start. TO. . . . . . . . . . . . . . . . . . . . . . . . . . . . . The potions bottle label has a space to write in the date, venue, time and an RSVP contact number or address. The Wizard Potions Party invite is arranged so that there are three to a page. The download is available in both A4 and US Letter size. Just click on the one you want to download it. If you're throwing a party, one thing you will need for sure is invitations. Here are some simple invites to get you going. Each one comes in a few different colours and the invites are suitable for a range of ages from children to adult. 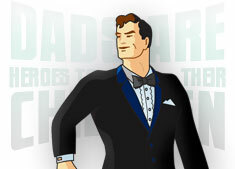 All are original and specially designed for dadcando, and couldn't be easier to download. For some of the darker background colour invitations, a good effect will be achieved using a light coloured, opaque ink gel pen, permanent white fine line marker, or a silver or gold marker pen. Write the full address of the venue here, if it is hard to find, you might also need to include instructions. Always include the postcode or zip code so that the person you're inviting can look up the address on the internet, or use their satnav easily. Don't forget to fill this bit in with the name and telephone number or address of the person organising the party. otherwise you won't know who and how many are coming. Keep a note of who you send invitations to and make sure that you have received an answer from each person so that you know how many to plan for, even if that means phoning them up after a week or so after sending the invites out.